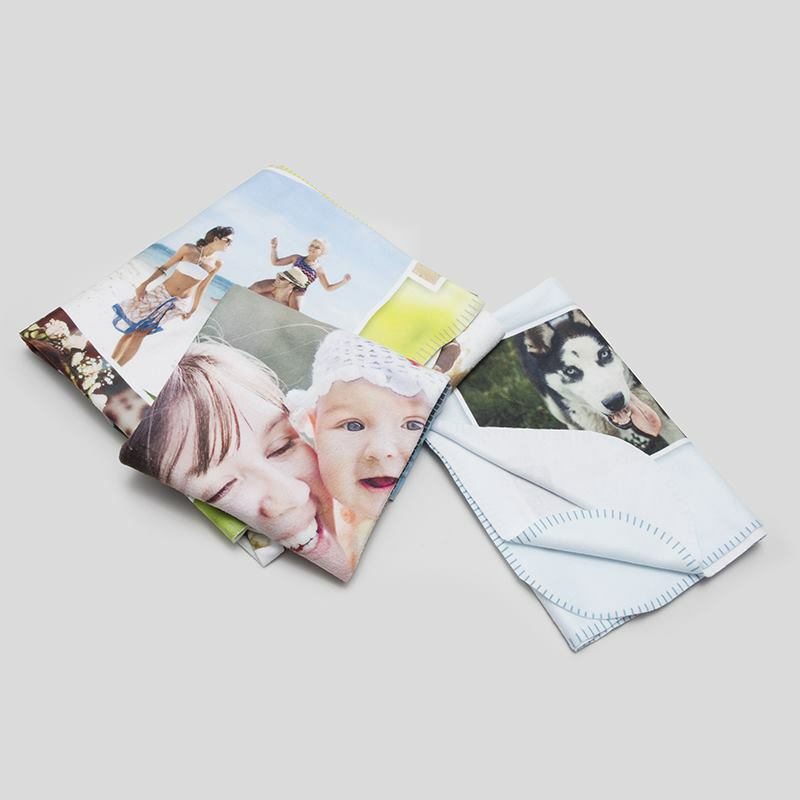 Design your own single layer printed blankets using your favourite photos and wrap yourself up with happy memories. Made from non-fray plush, silky smooth polar fleece, no sew single layer blanket printing is the perfect gift for a loved one or yourself. You also have the options to print the edge detail in a choice of four colours, add our brand label on the top left corner of your printed blankets. The machine washable print is long lasting, and we offer a 10 year guarantee on your single blanket. When you buy 2, get 1 for free. Printed and sent in one day. Printing your photos on a single layer fleece blanket makes for a truly special gift, where a loved one can wrap themselves up in treasured memories. Super soft with an exquisite print, your images look striking in full colour high definition detail. The plush, polar fleece fabric we use for your single layer printed blankets is non-fray and anti-pilling (won't bobble over time), ensuring it stays in the family for years to come. There are four sizes to choose from, ranging from small children's single blankets to large adult size to snuggle under. You can choose to add one of four print colours to the decorate the edges of your printed blankets, designed to look like stitching without any stitching at all. Safe, odourless, beautiful print for all the family to enjoy. I absolutely love my purchase, amazing quality and it looks exactly how i wanted it to. Very impressed! My photo blanket arrived within 6 days of ordering it. The quality far exceeded my expectations. I am delighted with the whole package from the ease of ordering,the communication from the company,the speed of delivery. A very professional organization to deal with. I have recommended them to all my friends and family. I loved this product. I purchased a photo fleece blanket and the quality of the photos was amazing, the blanket itself was soft and beautifully made. Shipping was so fast and came right to the door, I would definitely recommend and will be buying from bags of love again!! Buy 2 single layer printed blankets and get 1 for free. This is perfect for when you need to gift several family members or friends, or want to design a collection to use in different rooms at home. Press Start Design above and create a beautiful single fleece blanket for your own home or a loved one. Your single blanket is expertly printed and made to order. This surprisingly cheap photo blanket has the excellent print quality without the frills of sewing, or back colour. Your designs are printed onto the silky smooth polar fleece fabric, fusing the inks deep within the fibres, creating a strong print that remains vibrant even with regular use and washes. We leave the back unprinted, so the customised front attracts all the attention. Your no sew fleece blanket is hand cut to size, leaving the edges straight and crisp for a flawless finish. With 15 years experience in producing printed blankets, the print detail experience that goes in is second to none. For the small, medium and large printed blankets, you can edit and rearrange your photos to create a landscape or portrait design. This is ideal if the photo you want to use is portrait or tall or wide in nature. Alternatively, you can create a photo collage single layer fleece blanket, showcasing all your favourite snaps from holidays, events or just past memories. There are several pre-set montage styles to choose from and our design tool automatically creates the collage. You can also rearrange the photos manually if you prefer. Simply upload a collection of photos and apply them all to the blanket. If you're into crafts, you might want to add your own fringe at home by cutting strips into the edges. Fringes add another dimensions to the blanket, and can be good as a sensory gift for babies. Commemorate this special occasion with a gorgeous blanket, printed with the name of the baby, date, location, parent's names and a picture of the little one. Not only will this look amazing wrapped around the baby when they're being blessed, but it's also a sentimental keepsake to treasure forever. Design a single layer blanket to complement your existing interior design. Printed with patterns, colours, motifs or images that match the decor, it's an extra touch that brings harmony to the home. When draped over the bed or sofa, it'll look like any other stylish piece of furnishing. Use our photo collage feature to create a stunning memory blanket printed with treasured moments from throughout the recipient's life. For a remarkable milestone birthday, such as 80th, the single layer printed blanket will receive smiles all round and provides the opportunity to reminisce on memories as a family. Custom made throw for sofa or bed or home living space.